Mrs. Dahlen is a licensed Physical Therapist. 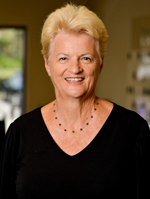 She earned her Physical Therapy degree from the University of Colorado in 1960 and her Master’s Degree in Religious Education from Loyola University of New Orleans in 2005. She was an Adjunct Professor of Physical Therapist Assistant Education from 1993-2000. She specializes in the treatment of women’s health issues, osteoporosis, geriatrics, balance and gait disorders, and CVA and neurological rehabilitation.